United Launch Alliance and Orbital ATK launched the OA-7 Cygnus mission to the International Space Station (ISS) on Tuesday. Flying atop an Atlas V rocket, Cygnus departed the SLC-41 pad at Cape Canaveral Air Force Station at the start of a thirty-minute window that opened at 11:11 local time (15:11 UTC). 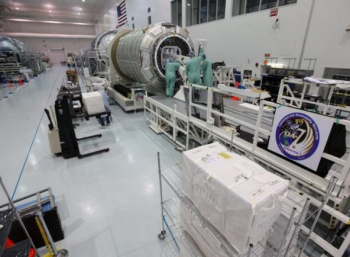 Orbital ATK’s Cygnus spacecraft, alongside SpaceX’s Dragon, is one of two spacecraft NASA use to deliver cargo to the International Space Station as part of the Commercial Resupply Services (CRS) program. Cygnus first flew in 2013, conducting a demonstration mission under NASA’s Commercial Orbital Transportation Services (COTS) program. The Cygnus spacecraft consists of a pressurized cargo module (PCM) and a service module built with Orbital’s experience of developing free-flying spacecraft with its GEOStar and LEOStar satellite busses. The cargo module was constructed by Thales Alenia Space and is derived from the Multi-Purpose Logistics Modules (MPLMs) that were carried to the station during the Space Shuttle program. An enhanced version of the Cygnus, with an extended cargo module and redesigned solar arrays and fuel tanks, debuted in December 2015 and is now the standard for all missions. Cygnus was a late addition to the Commercial Orbital Transport Services program, taking the place of Rocketplane Kistler’s K-1 vehicle, whose funding was canceled in 2007 after the company had been unable to meet project milestones. Orbital was awarded the contract to develop Cygnus in February 2008 as part of a second round of bidding. In December 2008 Orbital was awarded a Commercial Resupply Services contract for eight resupply missions. This was reduced by one following enhancements to the Cygnus spacecraft and the use of the more powerful Atlas rockets for the OA-4 and OA-6 launches, which reduced the number of missions that would be needed to deliver the required amount of payload. 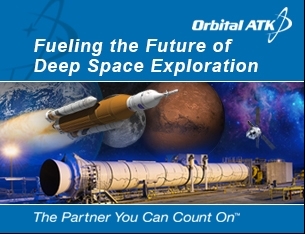 NASA has since extended the original CRS contract to eleven missions and awarded Orbital a new contract under the second phase of the CRS program for a minimum of six additional flights. However, Tuesday’s mission – OA-7 – will be the last of those in the original award to fly. 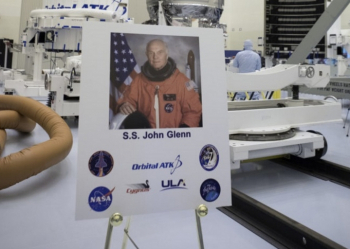 The OA-7 spacecraft is named the SS John Glenn, after the astronaut who was the first American to orbit the Earth. Glenn, a member of NASA’s original Mercury Seven astronaut group, was born in July 1921 and became the third American to fly in space aboard his Friendship 7 spacecraft during February 1962’s Mercury-Atlas 6 mission. Launching atop an Atlas LV-3B rocket – a modified Atlas D missile – Glenn’s capsule completed three orbits of the Earth before being deorbited for landing in the Atlantic Ocean, almost five hours after liftoff. Glenn was the fifth man to fly in space – following Soviet cosmonauts Yuri Gagarin and Gherman Titov, who completed orbital missions aboard Vostok spacecraft, and American astronauts Alan Shepard and Virgil ‘Gus’ Grissom, who made suborbital flights aboard Mercury spacecraft boosted by smaller Redstone rockets. Before his selection as an astronaut, Glenn served in the US Marine Corps as a naval aviator, seeing action in the Pacific during the Second World War and in the Korean War before becoming a test pilot. As the first American to complete an orbital space mission, Glenn became a national hero. This status resulted in him being removed from active flight status and he subsequently resigned from NASA to enter politics. As a member of the Democratic Party, Glenn was elected to Congress in 1974 as a Senator for the state of Ohio, serving until 1999. Glenn made a bid for the Presidency in the 1984 election, losing the Democratic nomination to Walter Mondale. John Glenn returned to space in 1998, at the age of 77, flying as a payload specialist aboard Space Shuttle Discovery during the STS-95 mission. 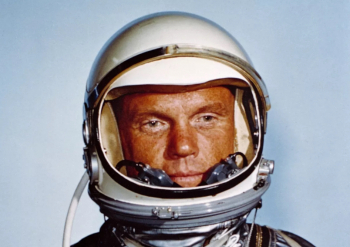 In the process, Glenn became the oldest person to fly in space, a record which still stands. He was the last member of the Mercury Seven to fly a space mission, and the only Mercury astronaut to fly aboard the Shuttle. The last surviving member of the Mercury Seven, Glenn died on 8 December last year. He was laid to rest at Arlington National Cemetery with full military honors earlier this month. The SS John Glenn is carrying 3,459 kilograms (7,626 lb) of cargo, including 954 kilograms (2,103 lb) of supplies and provisions for the crew, 1,215 kilograms (2,679 lb) of hardware for the US and international segments of the Space Station and 18 kilograms (40 lb) for the Russian segment. The cargo also includes two kilograms (4.4 lb) of computer equipment and 73 kilograms (161 lb) of hardware to support extra-vehicular activities (EVAs) or spacewalks by the station’s crew. Another 940 kilograms (2,072 lb) of cargo consists of scientific equipment and experiments to be performed aboard the ISS. The Advanced Plant Habitat will enable the crew to cultivate plants aboard the space station for bioscience research and experiments as well as helping to demonstrate food production in orbit. Another experiment, Magnetic 3D Cell Culturing, will use magnetism to allow astronauts to manipulate cell cultures and samples in cell growth experiments. The Antibody Drug Conjugates (ACDs) in Microgravity experiment will test new chemotherapy drugs in space, with the microgravity environment allowing samples of cancer cells to be grown that more accurately model how they would grow in the human body than can be achieved in a laboratory on Earth. Thirty-eight small satellites are hitching a lift into orbit aboard Cygnus, with a total mass of 83 kilograms (183 lb). Built to CubeSat specifications, Cygnus will deploy four of the spacecraft following its departure from the space station. The remaining satellites will remain aboard the ISS for deployment at a later date. CubeSat deployments from the International Space Station are made via the airlock of the Japanese Kibo module. The four spacecraft to be deployed directly from Cygnus are Lemur-2 weather satellites, built and operated by Spire Global. The satellites on Tuesday’s launch are the thirtieth, thirty-first, thirty-second and thirty-third to fly – with the spacecraft typically launched in multiples of four. Three-unit CubeSats, the Lemurs carry STRATOS – a payload which analyses the occultation of GPS navigation signals passing through Earth’s atmosphere to monitor atmospheric temperature, pressure and humidity. Each Lemur is also equipped with SENSE, a receiver for Automatic Identification System (AIS) signals from ships at sea, providing worldwide tracking for maritime safety. 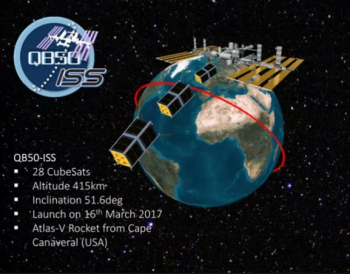 Twenty-eight of the satellites which will be deployed from the International Space Station form part of the QB50 program, an international educational initiative aimed at deploying an array of CubeSat-mounted sensors into Earth’s thermosphere. Originally conceived to consist of fifty satellites sharing a single launch, the project has now switched to use several smaller groups of spacecraft. The QB50-ISS mission will be followed next month by a PSLV launch with eight further satellites. The majority of QB50 satellites – including all of those on Tuesday’s launch – carry one of three standard instrument packages, consisting of a primary instrument and an array of thermistors, thermocouples and resistant temperature detectors. The primary instruments are either an Ion-Neutral Mass Spectrometer (INMS), a Flux-Phi Probe Experiment (FIPEX) or a Multi-Needle Langmuir Probe (m-NLP). These experiments are geared towards collecting long-term continuous in-situ measurements of conditions in Earth’s lower thermosphere. 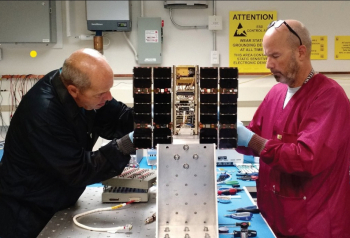 Instead of the scientific equipment, a small number of QB50 satellites will carry technology demonstration payloads. The QB50 satellites aboard Tuesday’s launch come from a total of seventeen different countries: Australia, Belgium, Canada, Finland, France, Germany, Greece, Israel, the People’s Republic of China, the Republic of China, South Africa, South Korea, Spain, Sweden, Turkey, Ukraine and the United States. Three of the QB50 satellites on Tuesday’s launch are two-unit CubeSats developed by Australian universities. Inspire-2 was built by the University of Sydney and carries the Langmuir probe payload, while the University of Adelaide’s SUSat and the University of New South Wales’ UNSW-EC0 both carry ion-neutral mass spectrometers. South Korea has also contributed three satellites, with the Korea Advanced Institute of Science and Technology (KAIST) contributing the INMS-equipped Little Intelligent Nanosatellite of KAIST (LINK), while the Seoul National University has provided SNUSAT 1 and SNUSAT 1b, both carrying FIPEX payloads. Three universities from the United States are also participating in the launch; the universities of Colorado and Michigan and Puerto Rico’s Universidad del Turabo. The US satellites are respectively named after Space Shuttles Challenger, Atlantis and Columbia. Challenger carries an INMS payload, while Atlantis and Columbia are both equipped with FIPEX. The Ao Xiang 1 satellite, carrying a FIPEX payload, was developed by the Northwestern Polytechnical University (NPU) of the People’s Republic of China, while NJUST-1, which carries an INMS payload, was built by the Nanjing University of Science and Technology. Phoenix, another INMS-equipped satellite, was built by the National Cheng Kung University of the Republic of China (Taiwan). 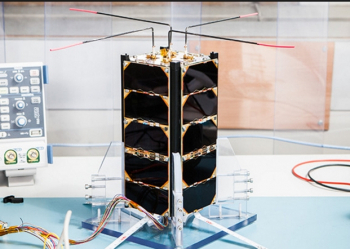 LilacSat-1, built by Belgium’s Harbin Institute of Technology and QBITO of Spain’s Universidad Politécnica de Madrid also carry INMS payloads. 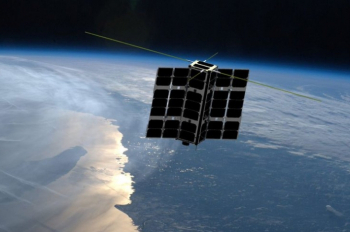 Aalto-2, developed by Aalto University, will be Finland’s first satellite. A three-unit CubeSat, it is equipped with a Multi-Needle Langmuir Probe (m-NLP). The remaining satellites with m-NLP experiments are Experimental Albertan 1 (Ex-Alta 1) of Canada’s University of Alberta, Greece’s DUTHSat and UPSat – the former built by the Democritus University of Thrace and the latter by the University of Patras – Turkey’s BeEagleSat and HAVELSAT, from the Istanbul Technical University and the government-owned defence contractor HAVELSAN – and Hoopoe which was built by Israel’s Herzliya Science Centre. The X-CuveSat and SpaceCube satellites, built by the École Polytechnique and École des Mines Paristech of France; Germany’s Student’s Oxygen Measurement Project 2 (SOMP-2), from the Technical University of Dresden; Sweden’s qbee50-LTU-OC which was produced by the Lulea University of Technology in partnership with British company Open Cosmos and the PolyITAN-2-SAU satellite which was provided by Ukraine’s National Technical University. Another source of CubeSats aboard the Cygnus spacecraft is NASA’s Educational Launch of Nanosatellites, or ELaNa, program. The ELaNa XVII group of satellites includes of the Goddard Space Flight Center’s IceCube, or Earth 1, mission which will use a three-unit CubeSat to test a new radiometer, operating on a frequency of 874 gigahertz, for cloud observation from orbit. 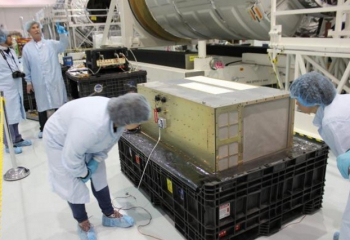 The California State University Northridge Satellite 1 (CSUNSat-1) will test a new power system incorporating capacitor and lithium-ion power storage and designed to operate at temperatures approaching -50 degrees Celsius (-58 Fahrenheit) without requiring radiators. Morehead State University’s Cosmic X-Ray Background 2 (CXBN-2) will continue measuring background x-ray levels following the first CXBN CubeSat, which launched in September 2012. The final three CubeSats aboard the SS John Glenn are not part of these programs. 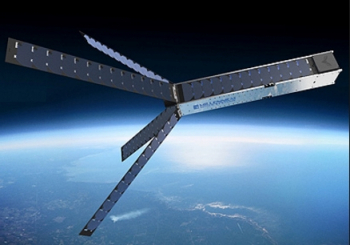 The Altair Pathfinder spacecraft is a commercial six-unit CubeSat developed and operated by Millennium Space Systems. The satellite, which measures 60 by 10 by 10 centimeters (24 x 4 x 4 inches) is the first six-unit CubeSat use the six-by-one unit configuration instead of the three-by-two configuration, measuring 30 by 20 by 10 centimeters (12 x 8 x 4 in) used by previous satellites. Altair Pathfinder will demonstrate the Altair Core bus developed by Millennium, which the company plans to offer to NASA and the Department of Defense for future missions. The Biarri-Point satellite, a three-unit CubeSat, forms part of the National Reconnaissance Office’s Colony-2 program, providing CubeSat busses for military technology demonstration missions. Biarri-Point is a pathfinder satellite for a multinational project, including the United States, Canada, Australia and the United Kingdom, which aims to develop a constellation of formation-flying satellites for a perceived military application. The Biarri-Point satellite is a prototype which will test a single satellite in orbit, ahead of three Biarri-Squad satellites launching to conduct the formation-flying experiment. The final CubeSat aboard Cygnus is believed to be another NASA-sponsored spacecraft; however its identity has not been announced. Tuesday’s launch marked the third time that Orbital’s Cygnus spacecraft has been boosted into orbit by United Launch Alliance’s Atlas V instead of its more usual mount, Orbital’s own Antares rocket. Although Cygnus was designed to launch aboard Antares, its heritage in commercial satellites makes it versatile enough to also fly aboard other rockets. The first Cygnus to launch aboard an Atlas was OA-4, the first mission after OA-3 was lost in an Antares launch failure. By moving both OA-4, and later OA-6 to Atlas, Orbital was able to continue meeting its cargo delivery obligations while Antares was grounded. The ability to launch on either rocket was given as an advantage of Cygnus when Orbital bid for a second round of CRS launch contracts. Even in its smallest configuration, the 401, the Atlas V is more powerful than Antares, allowing Cygnus to carry more payload. The need to maximize Cygnus’ upmass and maintain a busy resupply schedule led to OA-7 switching to Atlas last October, despite Antares’ successful return to flight that month with the OA-5 mission. Orbital ATK are expecting to fly out their remaining missions under the CRS-1 contract using Antares, with both Antares and Atlas available for the CRS-2 contract missions. Developed by Lockheed Martin, the Atlas V first flew in 2002. The rocket’s manufacture and operation transferred to United Launch Alliance (ULA) upon its formation in December 2006 through the merger of Lockheed Martin’s Atlas program with Boeing’s Delta program into a single joint venture. ULA markets launches to US government customers and carries out commercial Atlas launches on behalf of Lockheed Martin. For much of its first decade of operations, ULA had an effective monopoly on launches of large US government satellites. However, SpaceX has begun to challenge its dominance of this sector, resulting in new initiatives from ULA to compete. Last September ULA announced its RapidLaunch service, aiming to fill gaps in its launch manifest with commercial missions contracted at as little as three months’ notice. Two months later the company unveiled its RocketBuilder website, a publicly accessible platform allowing potential customers to tailor a rocket to their mission requirements, immediately seeing the cost of the vehicle and the potential savings that could offset the vehicle’s cost – such as reduced insurance premiums due to the rocket’s exceptional reliability. Tuesday’s launch is the first to be conducted under the RapidLaunch concept. Atlas V is a two-stage rocket, consisting of a Common Core Booster (CCB) first stage and a Centaur second stage. Up to five AJ-60A solid rocket motors may be attached to the first stage to augment thrust at liftoff, increasing the rocket’s payload capacity. However, for Tuesday’s launch, the rocket flew in its 401 configuration, which does not require any additional thrust. 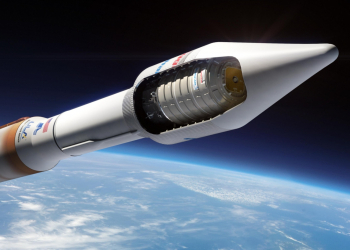 The 401 configuration also included a four-metre payload fairing and the single-engine version of the Centaur upper stage which has been used for all Atlas V launches to date. The rocket that flew on Tuesday had tail number AV-070. The Atlas V is, along with ULA’s older Delta II rocket, one of the two most reliable rockets in service worldwide. Since its debut in 2002, the Atlas V has completed seventy launches with sixty-nine successes and one partial failure, which occurred in June 2007 during the rocket’s tenth launch. Going into its seventy-first launch on Tuesday, Atlas V had achieved sixty consecutive successful launches. AV-070 began its mission with first stage engine ignition, 2.7 seconds before the countdown reached zero. 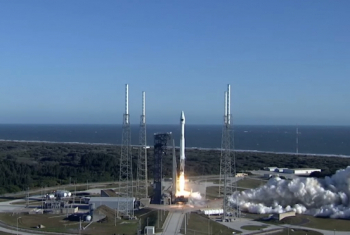 The first stage Common Core Booster is powered by a single RD-180 engine. The RD-180, which was developed by Russian engine manufacturer NPO Energomash, is a two-chamber engine based on the RD-170 that was originally developed for the Zenit rocket. The stage consumes RP-1 propellant, oxidized by liquid oxygen. Following ignition, the RD-180 built up thrust, with liftoff occurring when the engine’s thrust exceeded the weight of the vehicle – about 1.1 seconds after T-0. Atlas climbed away from Cape Canaveral’s Space Launch Complex 41 (SLC-41), before executing a series of pitch and yaw maneuvers beginning at 18.4 seconds into the flight. The rocket established itself on an azimuth downrange of 44.4 degrees. One minute and 22.5 seconds after liftoff, AV-070 passed through the sound barrier, achieving a speed of Mach 1. This was followed, 11.1 seconds later, by the vehicle passing through the area of maximum dynamic pressure or Max-Q. 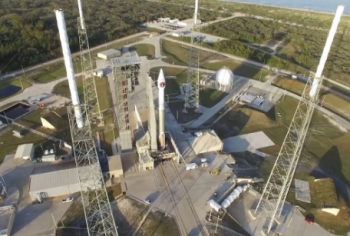 The first stage RD-180 engine burned for the first four minutes and 15.6 seconds of the flight before shutting down. This event, designated Booster Engine Cutoff – or BECO – precedes separation of the Common Core Booster by six seconds. After the booster separated, Centaur began its prestart sequence before igniting ten seconds after staging. 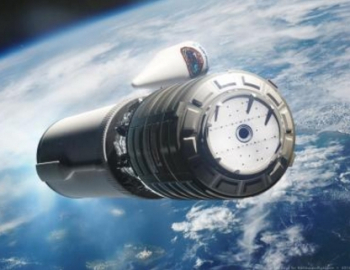 The Centaur is powered by a single RL10C-1 engine, manufactured by Aerojet Rocketdyne. 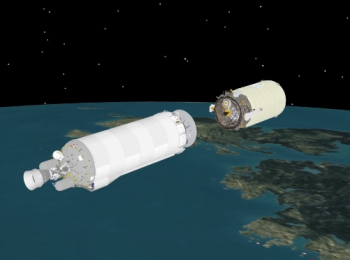 Burning liquid hydrogen and liquid oxygen, the RL10 can make multiple restarts to inject the Atlas’ payload into its designated orbit. During Tuesday’s launch the Centaur made a single burn to deploy Cygnus, followed by a disposal burn to deorbit itself after spacecraft separation. Eight seconds after Centaur begins its first burn, the payload fairing separated from around Cygnus at the nose of the rocket. 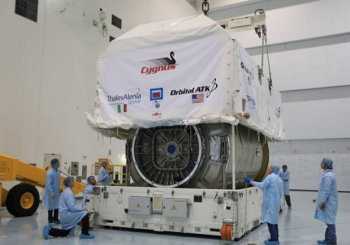 For Cygnus missions Atlas flies with a 14-metre (46-foot) long Extra-Extended Payload Fairing (XEPF), the longest of the three available four-metre (13-foot) diameter fairings. The fairing protects Cygnus from Earth’s atmosphere during ascent, and is discarded once the rocket is outside of the atmosphere. The Centaur burned for thirteen minutes and 40.4 seconds, taking Cygnus into low Earth orbit. Two minutes and 49.1 seconds later – at twenty-one minutes and 1.1 seconds mission elapsed time – Cygnus separated to begin its mission. The launch targetted a circular orbit at an altitude of 230.0 kilometers (142.9 miles, 124.2 nautical miles) and an inclination of 51.6 degrees. After separating Cygnus, the Centaur coasted for 27 minutes and 29.3 seconds, before restarting for a brief disposal burn. This 10.7-second burn deorbited the stage, guiding it to reentry to the south of Australia before it completes an orbital revolution. The stage burned up as it reenters the atmosphere, with ULA forecasting that any surviving debris would impact the ocean at around 67 minutes and 6.6 seconds after launch. Following separation from Atlas, Cygnus will perform a series of maneuvers as it chases the International Space Station ahead of a rendezvous currently planned for Saturday. In the meantime, the Soyuz MS-04 spacecraft is scheduled to lift off from the Baikonur Cosmodrome carrying Expedition 51 and 52 crewmembers Fyodor Yurchikhin and Jack Fischer to the outpost. Soyuz will arrive at the station ahead of Cygnus. Upon its arrival at the ISS on Saturday, the SS John Glenn will be captured by the station’s CanadArm2 remote manipulator system under the control of astronauts Peggy Whitson and Thomas Pesquet. The spacecraft will be berthed at the Unity Module’s nadir, or earth-facing, Common Berthing Mechanism. The Cygnus is expected to remain at the station for almost three months, with its departure currently slated for around 11 July. 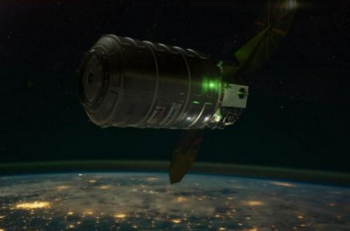 At the end of its mission, Cygnus will be unberthed and released by CanadArm2 to begin a free-flight mission. Once it has been released, Cygnus will raise its orbit in order to deploy the four Lemur satellites. It will also conduct the Saffire III experiment, which will use a self-contained package to ignite a fire within the spacecraft. A suite of instruments, including thermocouples, radiometers and cameras will record how the fire propagates as it is allowed to burn freely for up to six minutes. OA-7 is the third and final Cygnus spacecraft to carry a Saffire payload, conducting research which is expected to improve fire safety on future manned spacecraft. Once the research is complete, the SS John Glenn will be deorbited to a destructive reentry. A final experiment, the Reentry Data Collector 2 – RED-DATA-2 – will record flight data as the spacecraft enters the atmosphere and breaks apart. The experiment will also test two new materials which may be useful for future heat shield development under reentry conditions. Tuesday’s mission was the twentieth orbital launch to be attempted in 2017, with eighteen of the previous nineteen launches reaching orbit successfully. It was the eighth launch of the year for the United States, the fourth for United Launch Alliance and the third for the Atlas V, whose previous launch was that of NROL-79 on 1 March. 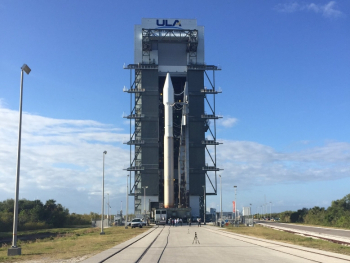 ULA’s next launch – and the next mission for the Atlas V – is currently scheduled to be the NROL-42 launch on 13 June. This mission, which will carry a spacecraft for the National Reconnaissance Office – likely to be a signals intelligence satellite bound for a highly elliptical orbit – will launch from Vandenberg Air Force Base in California. Cygnus’ next mission, OA-8, is scheduled for launch at the start of October atop an Antares rocket from the Mid-Atlantic Regional Spaceport on Wallops Island, Virginia.